'+H+' '+I+' '+D+' '+x+' '+r+E+" "+z+"
Receive all updates via Facebook. Just click the LIKE button below. All online and offline contest in Malaysia, including Facebook contest! Send in your 2 portrait photos, one taken before using KJI&CO product and another taken after using KJI&CO products. All photos must be "original" and can not be edited by any software or app. Share with your friends and get them to vote for you! 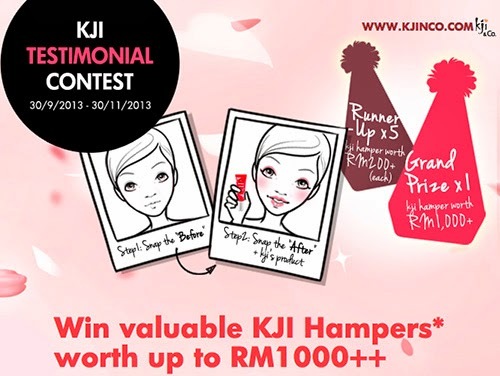 Visit Kji & Co Facebook fan page for more details. Join the EARLY BIRDs who get it EMAILED! Get Latest Contest+Result in daily email. Peraduan Minum & Menang dengan NESCAFÉ dan 7-Eleven Contest: Win Genting Grand & First World Hotel stays, Skyway & Petronas Petrol Card! Peraduan F&N 135th Anniversary Contest: Prizes worth up to RM1,350,000 to be won! Peraduan Nestlé La Cremeria "Hantar & Menang" Contest: Up to RM10,000 prizes to be won! 15% Off for your first purchase! Contest.1000savings.com brings you all online and offline contest information and tips in Malaysia, including Facebook contest. Please note that these contests aren't organized by contest.1000savings.com as we only provides information (unless specifically stated otherwise). While every care is taken to ensure the information is correct at time of publishing, such information may be changed without our prior knowledge, including dates, time and venue, specific contest terms, prizes etc. Any errors or omissions are deeply regretted and contest.1000savings.com cannot be held liable. It is also important to note that many contests are held by the respective organizer themselves, hence we cannot guarantee availability of the prizes or fairness of the contest results etc at any time. Use of an organisation's logo on contest.1000savings.com does not imply endorsement of the organisation by contest.1000savings.com, nor does it imply endorsement of contest.1000savings.com by the organisation. All Trademarks used are properties of their respective owners. © 2011- contest.1000savings.com. All Right Reserved.